Eastern Wyoming College has announced the open forums for the final two presidential search candidates the week of April 24-28. These will be the final two forums held before the Board of Trustees selects the new president of the college. Finalist Kelly B. McCalla, M.A. will be on the Torrington Campus on Monday, April 24th with an open forum to be held at 1:30 – 2:45 pm in the Fine Arts Auditorium. Mr. McCalla will be on the Douglas Campus for an open forum to be held on Tuesday, April 25th, 11:00 am – Noon in the Multi-Purpose Room. Finalist D. Ryan Carstens, Ed.D. will have an open forum on the Torrington Campus on Thursday, April 27th, 1:30 – 2:45 pm in the Fine Arts Auditorium. Dr. Carstens will be on the Douglas Campus on Friday, April 28th, 11:00 am – Noon in the Multi-Purpose Room. Community members, students and others who are interested are invited to attend all open forums. Input will be solicited from those in attendance. Kelly B. McCalla, M.A., is from Austin, MN. He received an Associate of Arts, General Studies, from Brainerd Community College in 1983, a Bachelor of Arts, English, minor Mass Communications, from Bemidji State University in 1985 and a Master of Arts in English from Bemidji State University in 1988. He is currently in an Educational Leadership Doctoral Studies program at the University of St. Thomas. Mr. McCalla is currently the Interim Vice President of Academic and Student Affairs at Riverland Community College serving Austin, Albert Lea and Owatonna, Minnesota. This interim appointment is scheduled for September 2016-June 2018. He is currently on leave from his position of Dean of Academic Affairs from Riverland Community College to serve his interim appointment. This is a position held from July 2014 – August 2016. From January 2014-June 2014, he served as the Interim Dean of Academic Affairs for Career and Technical Education at Minnesota State Community and Technical College in Moorhead, MN. Mr. McCalla was the Dean of Arts and Sciences as well as the Interim Vice President of Academic Affairs/Chief Academic Officer for Central Lakes College from July 2008 – December 2013. He was elected and served as a school board member and chair in District 182, Crosby-Ironton Schools in Crosby, MN from January 2009-January 2013. From August 2005 to June 2008 and December 1992 to September 1997, he was an English, Mass Communication and Workplace Skills Instructor for Central Lakes College. Mr. McCalla served as the assistant to the State Director of the United States Department of Agriculture – Rural Development on a full-time sabbatical position from October 2004 – September 2005 and also October 2005 – January 2007 on a part-time and continuing project-based contract. From October 1997 to August 2004 he was the Director of Academic Services/Instructional Technologist at Central Lakes College. Mr. McCalla was the co-recipient of the 2013 Minnesota State Best Practices in Diversity Award as well as the co-recipient of the 2013 Resources for Relationships in Diversity Award. He was recognized as the 2012 Minnesota State System Outstanding Academic and Student Affairs Administrator, the 2012 Phi Theta Kappa National Honor Society Administrator of the Year and Alumni of the Year. In 2010 he was a graduate of the Cuyuna Lakes Cohort of the Blandin Community Leadership Program and a 2008 graduate of the McSCU Board of Trustees Luoma Leadership/Chair Academy Program. He is a very active and involved community member and has presented at many conferences locally, regionally and nationally. D. Ryan Carstens is from Spokane, WA where he is currently serving as the President of Spokane Community College. A position he has held since July 2015. He received a Bachelor of Science in German (Social Studies minor) from Oklahoma State University, a Master of Science in Curriculum and Instruction from Oklahoma State University. Dr. Carstens also did graduate work with the League for Innovation in the Community College, Executive Leadership Institute. He received his Doctorate from the University of Texas at Austin, Community College Leadership Program, Educational Administration. Prior to his current position he was the Vice President of Academic Affairs at New Mexico State University, from March 2014 – July 2015. In the Spring of 2014, he served as the Interim Vice-President of Academic Affairs at Moreno Valley College and from 2012-2014 was the Associate Provost, Education and Community Partnerships at Salt Lake Community College. Dr. Carstens served in several leadership roles for over 12 years for the Lone Star College System, from 1999 to 2011, holding the following positions: Chair, SACS Accreditation Quality Enhancement Plan, Dean of Educational Services, Dean of Educational Initiatives & Technology Services, and District Director of Distance Learning and Instructional Technology. From 1997-1999 he was the Director of Distance Learning and Technologies Services at Eastern Idaho Technical College. He served as the Dean/VP of Distance Learning and Information Technologies Services at Rio Salado College from 1994-1996 and the Dean of Educational Resources from 1992-1994 at El Centro College. At Yavapai College he was the Department Chair and Director of Instructional Telecommunications and Yavapai County Extension Services from 1989-1992. He was the Coordinator of Instructional Technology Services at Central Arizona College from 1986-1989 and a Faculty Member and Director of the Technology Center for Teachers at the University of Houston –Victoria from 1984-1986. He is a graduate of Leadership Otero, 2015 and Leadership North Houston in 2004. In 2001 he was the Lone Star College System Employee of the Month. He has been a contributor to many publications and presented at many meetings and conferences. 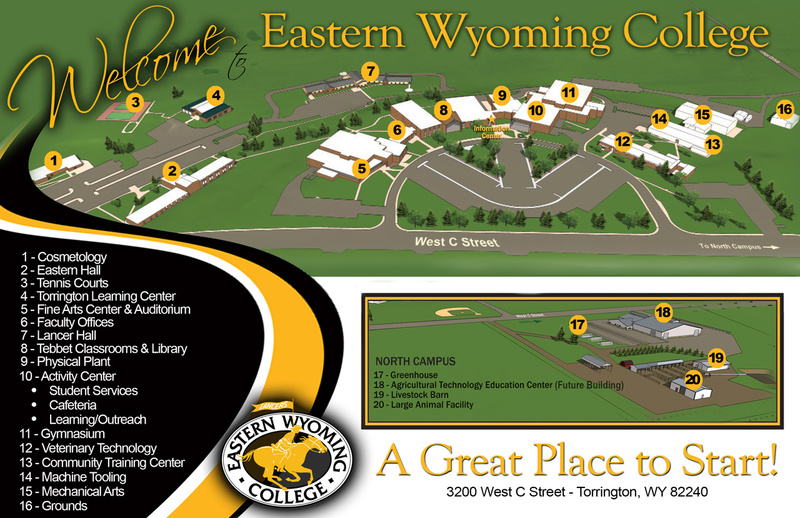 For more information on the Presidential Search at Eastern Wyoming College call 307.532.8303.